Small progress last night on the bommer. Would have gotten more finished but I stumbled a few times, silly mistakes, all recoverable with a little time and grousing. My last few large Apocalypse projects have taught me a little about “overbuilding and over engineering” these types of models. The problem comes with them usually being mixed-material things. Metals, many types of plastics, wires, rubber. The problem comes from getting some things to stick to others. PVC is a great, strong building material and it comes in tubes which is very handy for rokkets, engines, silos, aircraft bodies, etc. The problem with pvc is almost nothing sticks to it very well, hence one of the reasons it’s used on the plumbing industry. PVC to PVC with PVC glue sticks like they’ve been welded together, but I’m not attaching pvc to pvc. Polystyrene glues don’t adhere well to pvc – super glues are only slightly better than that. Epoxies work reasonably well but are still prone to shearing effects. This leaves us with sheet screws as our absolute best methods for attaching things to pvc. Things aren’t going anywhere without a lot of force. Now, don’t get me wrong, I don’t plan on throwing this thing from across the room to come crashing down on the table (cool image though) but I do want it to be stable and durable enough to play with and move/transport without having to build in special compartments to hold it’s own glue tubes for repairs every game. So that long winded distraction brings me around to my point/rule for building large items w/pvc. I try to attach polystyrene to the pvc with screws where ever I can and try to hide the screws afterward.Plumbers putty and two-part epoxies are my second tier adhesives. 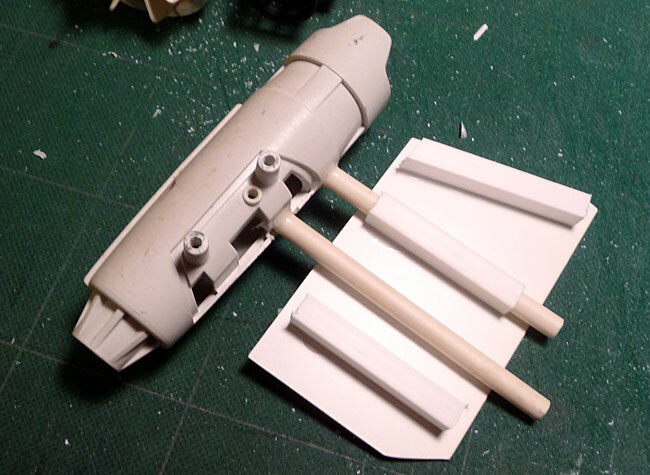 After that it’s super glues (very rarely though) and I try to use polystyrene glues only on styrene. Once I can wrap everything that’s [i]not[/i] styrene with styrene, then I can start all the details and work with the plasticard normally. Here’s what I [i]did[/i] get done last night. 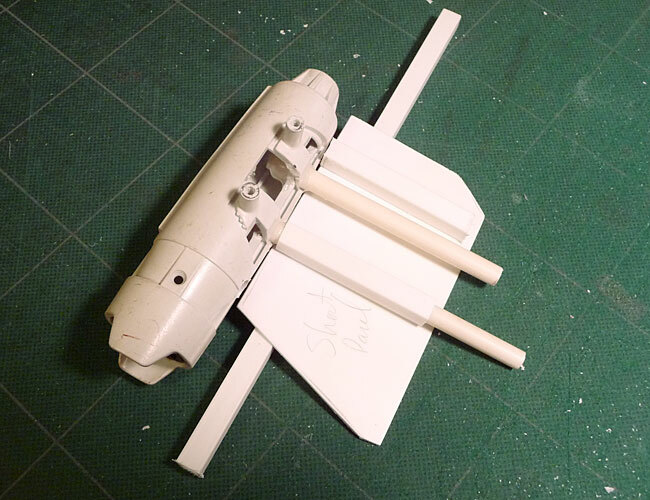 I removed the outer engines, after a little cursing, and fixed the angle on the starboard wing. Then I glues large square channel to the wing panels. 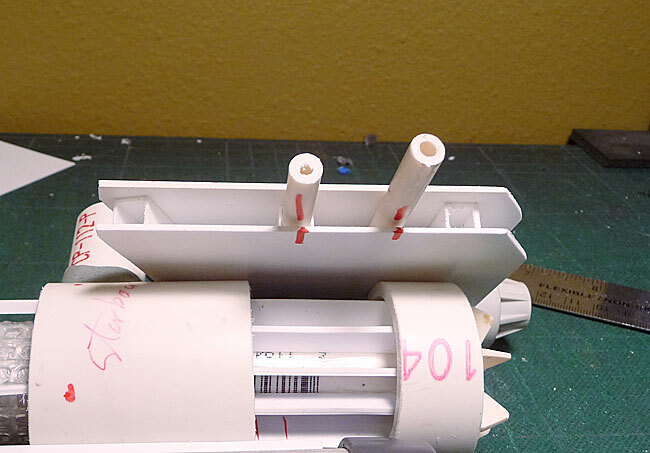 This channel perfectly fit over the stabilizing tubes (thank Mork), well, at least one from each side (dang Gork). The channels simply slide onto the tubes and I’ll glue everything thing down when they’re finished. 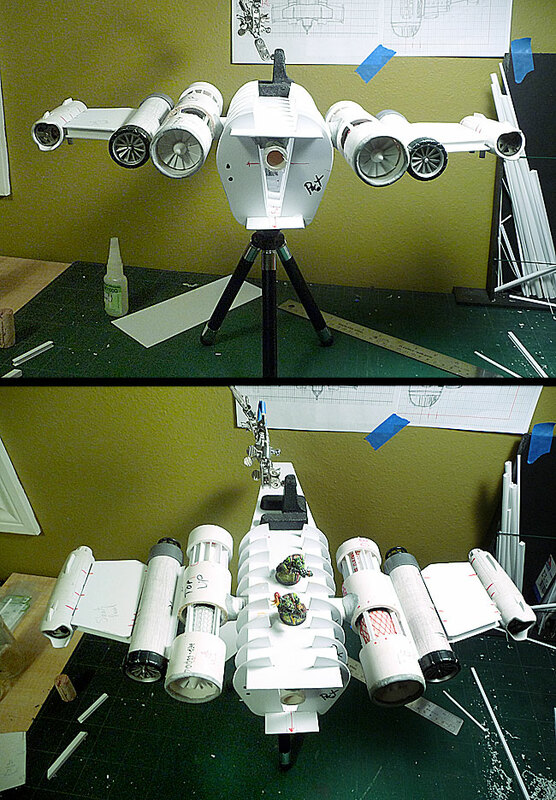 Most of the actual stress will be on the tubes between the second and outer engines so I’m not worried about the panels having to be super strong. When I’m done building the outer wing sections they’re get epoxied to the inner set of engines to make the best connection. The panels will add to some rigidity to the whole construction when done. Almost done with the main wing super structure!